- For best results add the PURE POND balls into a filter bag and place in the biological section of your filter in an area of water flow. - 500ml of PURE POND will treat a pond up to 10,000 litres (2,200 UK Gallons). 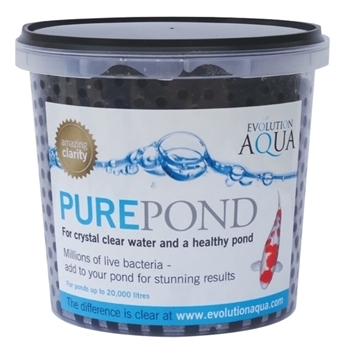 - 1 Litre of PURE POND will treat a pond up to 20,000 litres (4,400 UK Gallons). - 2 Litre of PURE POND will treat a pond up to 40,000 litres (8,800 UK Gallons). - You cannot overdose the pond with PURE POND, however for ponds under 10,000 litres, we recommend using a proportionate quantity of balls for the size of your pond, ie 250ml for a 5,000 litre pond. - PURE POND will work at its most efficient in pond temperatures above 12°C. - PURE POND is a natural product therefore it is perfectly normal that the balls may vary in size, colour and opacity. None of this will affect the performance of the product. - PURE POND can be used in conjunction with a UV-C.
- PURE POND is not intended to clear green water. It is recommended that an appropriate UV-C should be used to eradicate green water. - Once opened, keep stored in a dry environment. Do not use after the expiry date.